Fig. 8910, Fig. 8950 and Fig. 8995 Throttle Trip Valves provide effective flow control and emergency shut-off operation in a single, highly reliable valve assembly. As throttle valves, they are used to regulate flow of steam and gas in large, high-pressure pipe lines, such as the main steam line serving a large, high-pressure turbine or a turboexpander gas supply line. As trip valves, they add a measure of safety critical to these applications, without the expense of a separate trip valve. When tripped either manually or automatically, the valves rapidly shut down flow to protect valuable equipment. S&K Throttle Trip Valves feature an internal pilot valve arrangement to relieve pressure on the main disc as the valve is opened. The seal-welded seat ring is shrink-fit to the body and includes an expansion groove, to prevent distortion of the seating face. Durable materials improve performance and reduce wear. Flexitallic-type gaskets provide positive sealing at all cover joints. Designed for simple on-line adjustment of the yoke and latching assembly. Optional ball bearing, threaded spindle and latching mechanisms are available to provide mechanical assist for reliable low-friction operation. Venturi seats can be provided in high-pressure applications, reducing space requirements and allowing use of smaller operators. Valves may be specified with welded ends or ANSI flange connections for direct connection to steam turbines. Steam turbine start-up and shut-down. 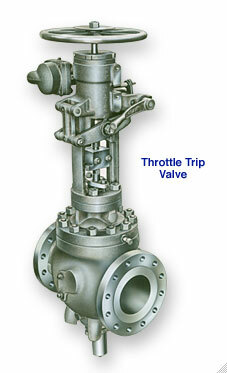 For more detailed information about Throttle Trip Valves, Bulletin 8C Literature. To submit a Request for Quote (RFQ) for Throttle Trip Valves submit an online interactive General RFQ Form.